Torment gets tormentier, plus Demon Hunter gets big tweaks. 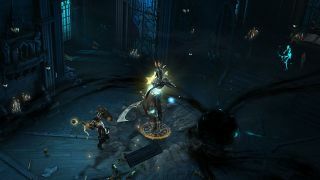 Blizzard has released the preliminary patch notes for Diablo 3's 2.4.2 patch, which will be hitting the Public Test Realm sometime...in the future...of the planet Earth (there's no date yet). If, for some reason, you find Diablo 3 to be pathetically easy even on the max difficulty level, you'll be overjoyed to hear that more difficulties are on the way. The Torment difficulty will soon continue all the way from XI-XIII. The patch will also make changes to Adventure Mode, the UI, and a couple of character classes. I'm not going to quote the whole thing, but know that certain gold rewards will be adjusted, The Menagerist Goblin and Nephalem Rift Pylons will get unique minimap icons, while a hotkey will be added to disable the U.I. There's loads more in the patch notes, which are of course subject to change, so take a look at the Blizzblog, particularly if you're partial to the Demon Hunter class.